Peaceful, tranquil and a fabulous spot for walking. Whether you wish to climb the summits or amble through the fells Langdale is a great starting point. 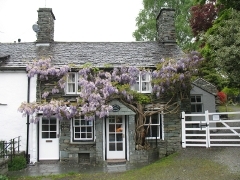 We have 2 lovely cottages both situated in the village of Elterwater at the mouth of the Langdale valley. Built in the 18th century the cottages are cool in summer and lovely and cosy in winter with their log fires and off-peak heating. Well behaved pets are welcome. We have owned the cottages since the early eighties and service and maintain them ourselves between lets. They are tastefully furnished with Ercol furniture and have LCD Freesat and a DVD. 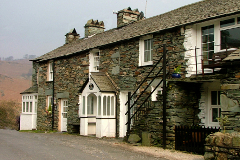 The cottages are of early 18th century traditional architecture with stone walls and wood beamed ceilings. Many of the original features have been retained. There are excellent Pubs and Restaurants in and around the village, a National Trust Car Park and a superb traditional Co-Op store in the nearby village of Chapel Stile. Wifi is available in both cottages. We hope that you enjoy browsing the website and look forward to hearing from you.